Load on windows startup: mark this checkbox to load NetWorx on Windows startup. This mode is recommended for those, who plan using the statistical data collected by NetWorx. Check for updates automatically : if this is enabled, NetWorx will be checking once a week whether a new release is available and notify you if a new version is out. Volume unit sets to display the usage reports in GB, MB, KB, bytes or automatically chosen units. Graph hotkey/Usage hotkey assigns a global hotkey to access the graph and usage reports. Multiplier determines how your usage is converted to kilobytes, megabytes and gigabytes. 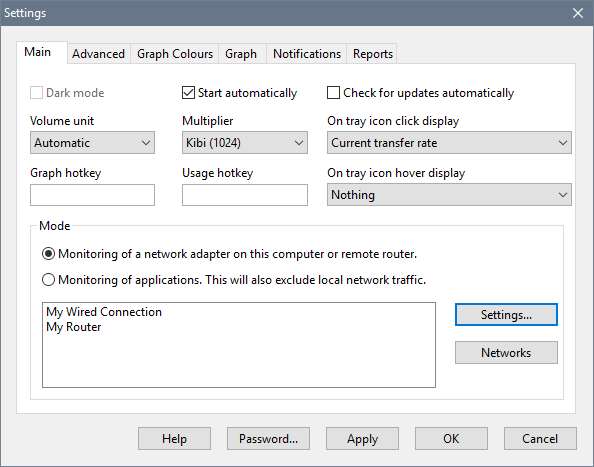 Monitored interfaces: if your computer has more then one network adapter installed, you can instruct NetWorx to monitor only one of them. This option is useful, when, for example, you have one LAN adapter, which connects you to your organisation’s internal network, and you use a dial-up (PPP) software adapter to connect to the Internet. In such case, you can choose to monitor only your PPP connection, and ignore the local LAN traffic. The Monitor my router rather than this computer option makes it possible to monitor traffic flow through a router between your network and the Internet. With the “Ignore local traffic within the LAN” option enabled, NetWorx can report lower usage than expected. It is common to see up to 5–10% under-reporting, depending on the specifics of your network connection. You can set the “Usage adjustment factor” in the hidden options to match NetWorx and your ISP data more closely. Ignoring local traffic within the LAN requires a network driver that comes with the installation package, and therefore is not available in the portable edition. It is however possible to ignore local traffic in the portable edition if you have WinPCap installed on your computer. In this case you can selectively ignore local traffic on a specific interface by choosing it from the drop-down list of monitored interfaces. The Networks button lets you exclude certain networks from monitoring. For example, if you have got NetWorx installed on a laptop and you would like it to monitor traffic in your home network only, you can use this feature. It detects all networks that you connect to and identifies them based on the MAC address of the default gateway. You can either monitor all networks that you are roaming in, or specify networks to monitor. Use the Password button to password-protect access to the settings, resetting usage data and quitting the application.